With just 24 hours remaining in July this post is coming down to the wire. This installment of Bits & Pieces brings some notable enhancements for July. We've already teased a few of them but the previously unmentioned updates will also make lives easier for attendees and organizers alike. First up is a change that allows attendees to update their credit cards or bank accounts on file. Since adding deferred payments last year, we've struggled with how to permit accounts to be added, updated and removed while still ensuring that organizers have a valid account on file at all times. Now under the "Billing" tab, any account on file may be removed so long as it is not the account of record for a current registration. If so, the attendee will have to replace it first using the new update link. Also new to the payment system is our previously announced refunds capability. Now send money back to the original account using the new refund button to any transaction from an event that has ended in the past 90 days. Beyond that, transactions will be locked. 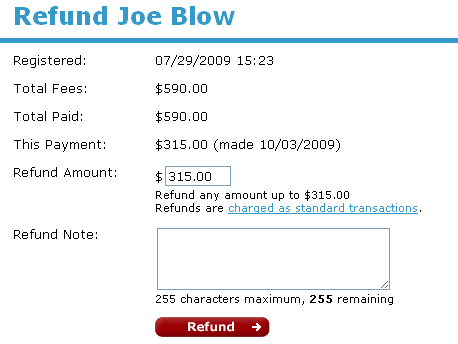 The form lets you perform full or partial refunds. Unlike regular transactions where the fee is subtracted from the total, for refunds we add the fee on top of the amount. This ensures that you can easily specify how much money should be returned to the account without doing any math. We display your cancellation policy alongside the form making it easy to determine what applies in each individual case. Refunds are currently being tested by a few customers and initial tests are going well. We'll be making it generally available soon. The venerable CKEditor has been our WYSIWYG editor for several years now and is loved by all... except when it comes to pasting from Microsoft Word. The truth of the matter is that Word is a real pig of a generator but as the desktop standard few people are willing to switch to something better. Instead, the latest CKEditor 3.3 has a vastly improved MS Word paste feature that strips out the illegal and irrelevant HTML that Word generates behind the scenes. This has several advantages including making your pages smaller (and faster), being more compatible across browsers and generally being easier to work with. Finally, we added a few new attendee and assignment reports to help new organizers jumpstart their reports. Few of our built-in reports include the custom data collected by organizers in the form of event and club questions. These new reports should help organizers see additional ways of including and filtering their data as they analyze and prepare for their events.